No sign-up is required, no ads and short. It is the simplest way to keep track of the automotive world. 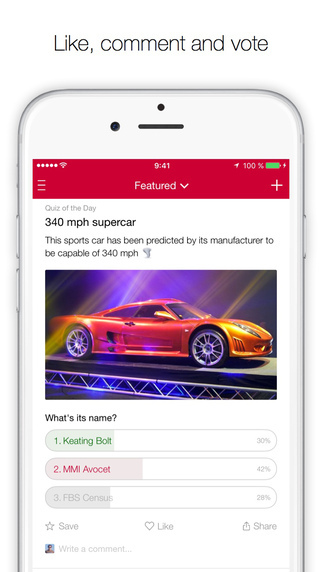 We keep track of the trends in the automotive industry, and we report them to you in less than 360 characters. We cover everything from spy shots of the new 911 to new hybrids. We also provide the most up to date info on auto shows around the world, ranging from small meets to the Geneva Auto Show, and discuss what new tech trends are being introduced into cars, ranging from autonomous vehicles, to hyper-cars. The time is now to get the car news you deserve, without having to read through 20 pages. Drive - Car News Reinvented talks about everything you care about, Euros, JDM, Imports, Domestic, customizations, hybrid, electric, self-driving, and all new technologies being used in NASCAR, Formula, Rally Cross, and every day applications. 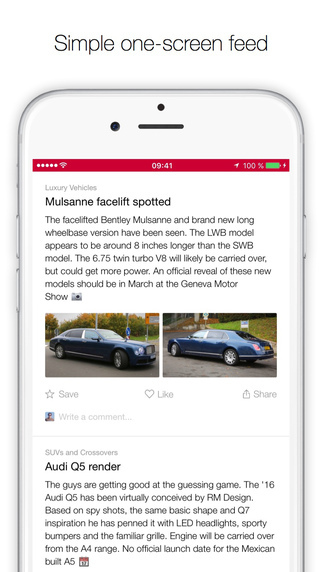 Now you can publish your own stories to Drive. Choose among dozens of channels, write your posts and see them promoted to the Featured section by our editorial team!